The NAGRA LB has been designed as the natural successor to the ARES-C and the ARES-BB+ recorders, and it is specifically designed for broadcast applications although naturally it is also very well suited to a multitude of other recording applications. Similar in size to the ARES-BB+ the LB offers communication possibilities never before seen in a professional broadcast recorder. 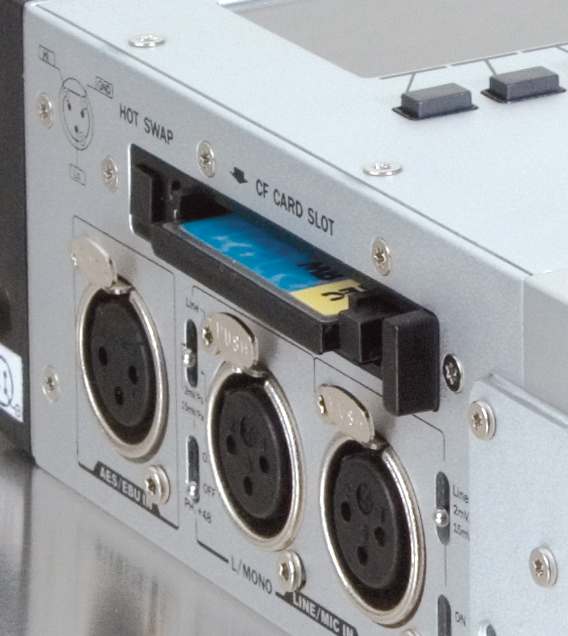 It offers two analogue audio inputs and a single stereo digital input. The Nagra LB will record in either PCM linear audio or in MPEG-1 layer II or MP-3 compressed audio formats. 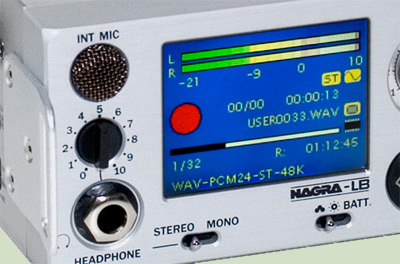 The inputs are equipped with traditional NAGRA microphone pre-amplifiers for dynamic and phantom +48V microphones. The LINE input will accept up to +24dB. The audio levels and current operating mode of the recorder are shown on the colour display mounted on the front of the unit. Above the potentiometers three leds are fitted to indicate audio levels as on the ARES-PII+, BB+ and Nagra VI. The front display becomes inactive when the editor on the top panel of the machine is in use. The built-in microphone can also be seen in the top left corner of the photograph. The Nagra LB is fitted with an internal 2GB NAND flash memory which serves two important roles. Firstly as a back-up media should the extractable compact flash card be full, but also as a spontaneous memory for recording while the extractable card is changed. Simply pressing the “Hot Swap” button next to the slot will open a 30 second window allowing the inserted card to be replaced even while the recorder is actually recording. The top of the LB is equipped with a built-in audio editing system with its own dedicated colour display. It allows editing of broadcast wave MPEG 1 layer II files and 16 bit PCM files at 32 and 48 kHz. Thus in-the-field editing i spossible and gives a graphic waveform display. Once the editing of the audio material is complete, the file can be transmitted to the studio either over IP (through the ethernet connection using the File Transfer Protocol “FTP” connection) or via a GSM phone through the Bluetooth option. Naturally the USB port also serves as a generic drive when connected to a computer to file transfer can also be done this way. Removal of the compact flash card is a final possibility for removing the audio from the recorder. The HOST USB port can also be used for an external memory stick for file transfer. The LB is powered by 8 “AA” batteries in a removable battery compartment. This may be fitted with rechargeable cells if required, which are in turn charged through the Hirose connector on the battery box body using the built-in charger circuit. Battery life 8 hours (8 x NiMh 2500 mAh) Record @ 24 bits 48 kHz with 2 x phantom +48V (2 x 4 mA), continuous recording. Between 5 and 5 1/2 hours with 8 x LR6 dry alkaline cells.